I signed us up for Gen Con within the first 24 hours of tables opening, but they were already completely booked! That show fills up fast. So after a long time on the wait list, we ultimately didn’t get into the show. Ah well, next year! 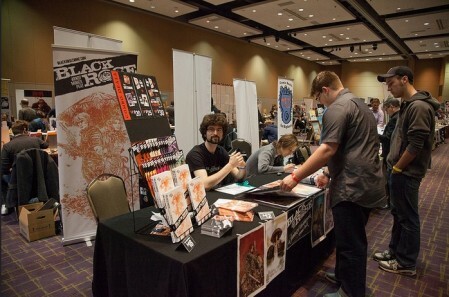 So to fill out our 2014 schedule, we’re headed back to the excellent Cincy Comicon on September 6 and 7. This show is packed with great artists and totally focused on comics. Then in 2015 we’re going to be at the Indiana Comic Con in Indianapolis. It’s only in its second year, but the opening show was huge and we’re sorry we missed it this year. Put it on your calendar: March 13-15, 2015. And though they haven’t announced it on their website yet, our hometown Appleseed Comics & Art Convention will be returning for another two-day event on May 16 and 17. Our favorite show of the year, you know we’ll be there. We’ll probably add another show in Fall 2015 as those get announced. Maybe something new this year? We’ll see you on the floor!